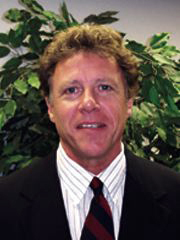 While he was a student at UF in the 1980s, Randy Braith initiated research on heart failure and transplantation. Twenty years later Braith continues the same research that compelled him during his doctoral studies. The primary focus of Braith’s research program includes the pathophysiology of heart failure and homeostatic mechanisms after heart transplantation. Braith conducted the early experiments that characterized exercise performance of the chronically denervated human heart. His lab was the first to experiment with implantation of rate-responsive pacemakers as a countermeasure for chronic cardiac denervation and the first to identify severe deficits in pulmonary oxygenation of arterial blood during exercise in heart transplant recipients. Braith was the first to elucidate the role of chronic cardiac denervation in the severe form of transplant hypertension suffered by heart transplant recipients. Through a methodical series of fluid-loading studies conducted in his laboratory and at Shands Hospital at the University of Florida, Braith determined that heart transplant recipients have avid renal salt and water retention that ultimately results in dramatic expansion of blood volume. “The expanded blood volume, in turn, causes severe de novo hypertension that is refractory to standard antihypertensive drugs,” Braith says. Braith pioneered the application of resistance training programs for heart transplant recipients to prevent glucocorticoid-induced osteoporosis. He and his students have also demonstrated through biopsy techniques that resistance exercise training reverses skeletal muscle myopathy in heart transplant recipients. Present research efforts in Braith’s lab focus upon hypertension, endothelial dysfunction, and arterial stiffness in patients with chronic heart failure and in heart transplant recipients. Through his joint appointments in the Department of Medicine (Division of Cardiology) and the Department of Physiology and Kinesiology, students receive experience conducting pathophysiological research in human populations in collaboration with acclaimed clinician investigators.